There's a reason pesto is one of Italy's most beloved sauces. Tossed with pasta, it doesn't need much else to transform into a satisfying, filling meal. This classic pesto combines toasted pine nuts, garlic, basil, olive oil and Parmesan cheese for a simple, delicious sauce that you'll want to put on everything. You can enjoy this spaghetti recipe either hot or cold, which makes it the ideal dish to serve up when you're hosting large gatherings or packing a meal for the road. The vegetarian dish is also kid-friendly and ready in half an hour, so it's great for busy weeknights. Make pesto in batches and store it in the freezer in small 2 to 4 ounce containers. When you're ready to make this recipe, bring the pesto to room temperature. It's equally delicious spread on sandwiches, used as a pizza sauce or even drizzled onto scrambled eggs! Per Serving: 495 calories; 34g fat; 37.4g carbohydrates; 11g protein; 11mg cholesterol; 497mg sodium. A good classic pesto recipe. Served this with some lemon pepper shrimp and it worked pretty well together. I did add tons of parmesan cheese to it cause that's normally how I would eat a pesto pasta. A friend of mine suggested adding some cream cheese to it for extra creaminess. I will have to try that next time. I really enjoyed this fresh pesto pasta dish. I've never made pesto sauce before, but this is much better than store bought. It also goes great with shredded chicken. This is the only pesto recipe I use. It's perfect every time. 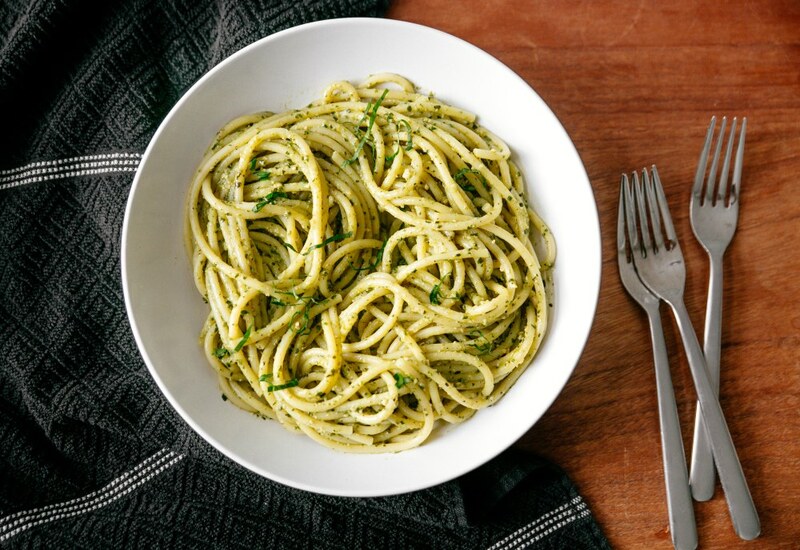 Sometimes when I'm craving something rich and creamy I will stir in a little cream cheese at room temperature to the pesto spaghetti until melted. So good! Love this pesto recipe! I usually make it with zucchini noodles. I also like to squeeze a little lemon juice on top. Perfection. Really delicious recipe, perfect with toasted pine nuts. Something about the flavor after roasting in the oven, I don't know what it is. Amazing.